Importance. 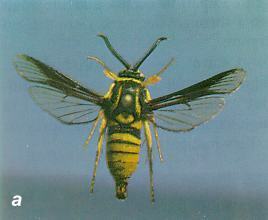 -- This borer attacks the lower trunk of red and white oaks throughout the East. 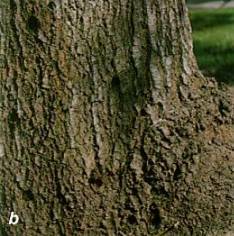 In the South, attacks are most common between root flanges of large red oaks. Damage includes degrade, entries for decay and nursery cull. Identifying the Insect (figure 20a). -- The purplish-gray larva has a black head and a brown thoracic shield, and is about 1 inch (25mm) long. Adults are colorful, black and orange banded, beelike moths with a wing expanse of 1.5 inches (37 mm). Identifying the Injury (figure 20b). Sap spots and fine frass first appear. Later, granular frass is ejected in clumps from the .3 to .6 inch (9 to 15 mm) entrance holes. There is little mining under the bark. Galleries are .3 inch (9 mm) in diameter and 4 inches (10 cm) long in the wood, and shaped much like those made by carpenterworms (figure 20c). Biology. -- Moths emerge during June and July and deposit eggs in bark crevices. 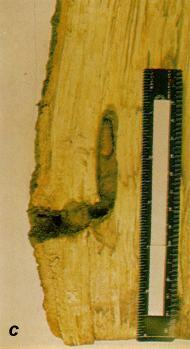 Eggs hatch in 15 to 18 days and the larvae tunnel into the bark and wood of host trees. Pupation occurs within the gallery. A generation requires 2 years. Control. -- Open-grown trees are most susceptible, thus maintain a well stocked stand. Identify and remove brood trees. Prevent or minimize injuries. Larvae can be "wormed-out" with a knife and wire. Insecticides will protect valuable trees. Individual borers can be killed by gallery fumigation. Figure 20. -- (a) Male moth of oak clearwing borer; (b) oak clearwing borer entrance holes in bark; (c) gallery made by oak clearwing borer.